My mother told me I had gingivitis when I was a kid and my dentist told us to just remove my milk teeth via procedure and not naturally. I think it wasn't taken out correctly in a specific sequence which caused my crooked teeth up and down. This kind of process may cause development delay, crowding and impacted or missing teeth. After I had all my permanent teeth already, we already noticed that I have crooked teeth, having braces is quite expensive that time. We just let it that way. That's a hard thing for me - to practice in front of the mirror before taking photos, if you can see most of my photos, you can only see me smiling without showing any of my teeth. Let me show you how I smile with all of my upper teeth. June 2016, I decided to have my braces I really desire for so long. During my pre-dental treatment, my dentist who's also a licensed orthodontist required me to get my Xray, cast, and impressions for my teeth. The pain of putting the metal and brackets is tolerable. My dentist's way is to have the teeth move, then she'll start to extract few teeth to make space for the alignment. I'll schedule this by this week. A lot changed in my hygiene. I immediately brush my teeth even I just had my snack, since the Plaque forms easily around the brackets. I am also skipping hard and sticky foods lately like cub corn, hard cooked veggies like carrots or string beans, meat - it should be as soft as corned beef for me to chew. I thought I'll be taking a soft diet, surprisingly I can still chew a lot of food on my right side even after the 1st adjustment - which my friends who had braces told me it would be the hardest part of this period. If you'll ask me how long would it take for this procedure? It would be 2 years if I'm prompt with my dentist visit. 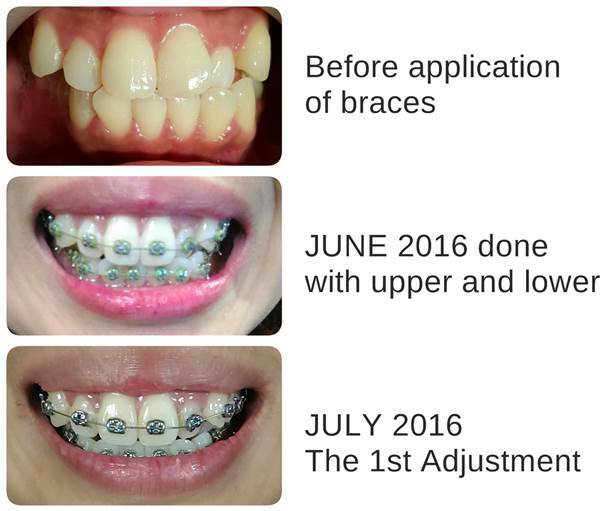 For my condition, it costs Php 32,000 which includes brace installation and adjustments only which is done every 3 weeks. I think it would be the cheapest here in my area during this time. Did you take pain killers during the procedure? No, for me it's tolerable in my 1st month. Silver, Grey, Pink, Blue and Purple. I switched to silver after the during my 1st adjustment because in some photos my Yellow-green band makes my teeth a bit yellow, and sometimes it depends on my lip color as well. If you're interested with dental check-ups, extractions, and other common dental procedures, you can check my dentist Dra. Shelly (Tooth Depot) - Upper Antipolo.